• No slip gloves. • 3D Logo on each glove. • Show your team spirit. • Perfect gift item! 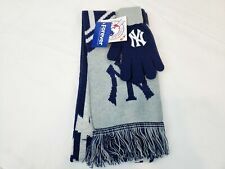 New York Yankees Scarf And Gloves New MLB Baseball NY Fan Show Your Fan Pride . Condition is New. Please See Pictures. Free Returns. 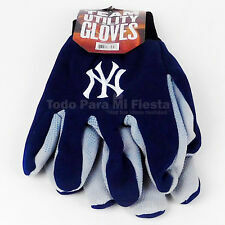 New York Yankees Sports Utility Gloves - New. Has Jersey Dot Palm (these are like grippy dots on the palm). Embroidered Team logo design! 100% polyester, hand wash. To reach us by phone: 585 200 5799. NEW New York Yankees TEAM COLORS CAMO UTILITY GLOVES. Up for sale are the new Forever SPORT UTILITY TEAM LOGO gloves. GREAT LOOKING GLOVES. Perfect gloves for all seasons. Driving, Gardening, Jogging, hiking all outdoor activities. NEW YORK YANKEES Sport Utility Gloves. by Forever Collectibles. One size-adult. Stitched "NY" logo. New York Yankees Camouflage Sports Utility Gloves - New. 100% polyester, hand wash. To reach us by phone: 585 200 5799. We will be glad to rectify any problems you may have. within the United States. New York Yankees MLB Camoflauge Utility Gloves FREE SHIP!! New York Yankees Pair of Camoflauge Utility Gloves. These camoflauge utility gloves are perfect for showing your team pride while working outdoors! They feature a team-colored camo pattern and an embroidered applique team logo along with a non-slip dimpled grip pattern on the underside. Forever Collectibles New York Yankees Work / Utility Gloves. The gloves have an elastic stretch cuff and dot grip on the palm and fingers. Machine washable. Sport Utility Work Gloves Features Sport Utility Work Gloves. New York Yankees. MLB Baseball. New Gloves. YOU MUST TAKE FULL RESPONSIBILTY IF YOU SELECT FCI. NOT SECURED. What a great gift to keep the Yankees spirit alive during the cold winter months! The 100% acrylic navy and gray scarf says Bronx Bombers and has the NY logo featured on it. The ice scraper mitt has a water and wind resistant exterior and cozy fleece lining. NEW YORK YANKEES SPORT UTILITY GLOVES. 100% POLYESTER KNIT JERSEY TYPE MATERIAL. NEW NY New York Yankees Team Utility Gloves-one size adult. Sports Utility Gloves With Palm Grip. Team: New York Yankees. Style: Sports Utility Gloves. Sport: MLB.